No musical genre is without stereotyping and a cliche attempting to embody its most devoted fans. Pop punk is one style that endures some particularly pronounced sub-cultural associations and, among them, album-long continual reflection and examination of difficult personal crises – practical, as well as emotional and existential – is not all that common of an expectation, save for those bands that elect to also take on Christian music labeling and all the associations that come with that too. Then of course, that edge bestowed to pop punk, that defiant tendency, the very misunderstood ethos of many such bands who have seen countless teenagers through their adolescences, has the potential to be overshadowed by expectations of excess positivity, a softness – not necessarily musical but lyrical – or just plain God-laden songwriting. The daunting, well established difficulty that comes with this particular set of artistic dedications is no deterrent for one band in the suburbs of Chicago. 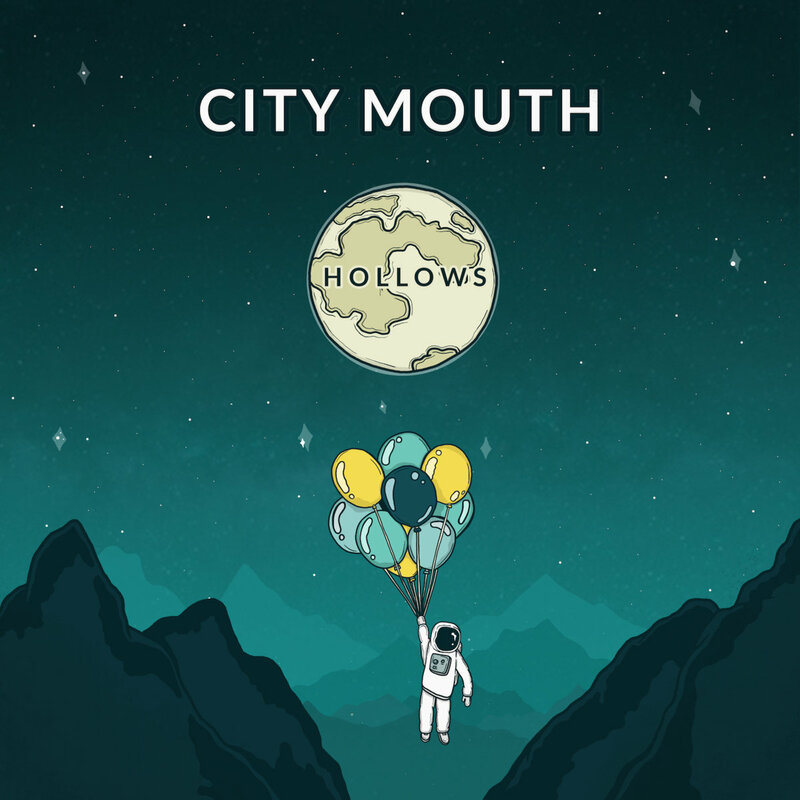 City Mouth, who have been together since 2013, have released a new EP titled Hollows (Take This to Heart Records, 2018), that pursues a relevance on the surface with its blended springtime release and fresh start-minded motivations. However, the band goes even further to highlight this conceptual starting point with lyrical language that is undeniably religious and carries no hesitation in its mingling among shouty harmonized choruses; comfortably resolving, rhythmically consistent major chord progressions and occasionally effect-filtered vocals. A few bands over the years have balanced the lines of raw musicality and spiritually driven contemplation but, it’s not an easy road to take and it’s not a route given any extra leg up in leading to widespread, enduring status among music listeners. Even for the handful of such artists that have really succeeded and might be thought of upon listening to Hollows (Relient K for one,) City Mouth goes far beyond the line of indirect, multi-interpretable references for the religious, where longer running musical peers often opt instead, to stop short and retain approachability. So, is Hollows overly optimistic and-or blatantly pious to the point of distracting from any potentially noteworthy composing – in much the same way an author excessively using one descriptive phrase takes a reader’s focus away from the big picture anytime the operative phrase recurs? Now, if someone is the kind of listener who simply recoils at the sheer mention of any and all things spiritual, reflective, godly, or religious, Hollows is going to probably send them flying back into the wall. Still, that analogy doesn’t translate to mean that this seven track EP comes across solely as repetitious and praise-phrase driven the way some slices of Christian-fueled records do. Yes, City Mouth is blunt and shows no intent to obscure where powers and forces beyond human living fall into the complicated state of minds Hollows is out to reveal. Right from the very first line of opener, “Lay Awake,” (I thought of going back to Jesus), Pow establishes a pre-existing relationship with religion and spares no expense further ensuring the point isn’t missed or dismissed as a casual appreciated, pop-culture reference (Inner searches going nowhere / Habit pushing me to pray / Tell me a way to get out and to still be saved). Here’s where things turn unexpected and pleasantly head-titling. While Hollows jumps right into the thick of an innermost conflict, the rest of the EP – as spiritually and God driven as it is – doesn’t devote the rest of its narrative time to just outright declaring with unwavering, gleeful, exclamatory certainty that an injection or augmentation of God, church, prayer, or faith is the solution to any of Hollow’s emotional fracturing. Nor does the album do the polar extreme opposite and stick with merely launching highly vague questions to anyone out there and doing so with an increasingly emotional drive that, with enough presence, might start to sound like helpless ambiguity. Instead of either of these singularly defined approaches, City Mouth manages to settle quite astutely on a line that floats carefully between frustration with, questioning of, and confidence in, engaging with God and religion. A level of personal inquiry remains throughout but more often than not, comes across with a rapport projecting intrigued curiosity about all the former, over dramatic and solely expectant naiveté.There’s also a degree of emotional self-awareness that permeates many of the ups and downs formed by the songs; something that goes well against the grain of the more emotionally self-indulgent stereotype pervading the expectations of contemporary pop punk songwriting. Even the exceptionally well-filmed music video for single, “Curse My Name,” balances quirky and familiar secular angles for the song’s visuals and narrative respectively – balloon-wielding astronaut with a faith crisis and acknowledgement of an ultimately hollow sexual relationship – for an otherwise spiritually self-reflective piece of writing. Still, as well as City Mouth juggles its conceptual elements on the EP, the strength in Hollows’ blending doesn’t come only from how its ratio of the sacred to the secular is divided. Song structure that sees lyrics sometimes hanging off the end of verses phrases, creating two-sided implications a la early Taylor Swift (I don’t have faith but it helps me still to / Pray I’ll figure out how this’ll pan out), as well as atypical sonic design choices, stir up more surprise throughout the EP. Things like soft edged, orchestral sounding trumpet – as opposed to the attack-heavy and decay-light tone often heard in genres like ska – that feels more expected among obscure folk like Beirut or the romp-and-stomp arrangements of Mumford & Sons; the digital drum loop at the beginning of “Branches” that sounds like it was sampled right out of an old model Casio keyboard; the chip-tune style synth woven into the end of the closing track, “Stay Awake;” and even the harmonized vocoder-tinged vocals on the EP’s mid-point “Head Trauma” all coexist on Hollows to reveal City Mouth as far more tonally flexible than a centrally pop punk association might be able to imply. Furthermore, production decisions at various points on different songs give the EP additional facets of uniqueness and stylistic accomplishment it would lack otherwise. The heavy frequency filtering and sound wave shaping that takes listeners from the outtro of “Anywhere But Here” right into the most religiously overt track, “Body and Blood,” is just one example. However, the seamless and wide filter adjustment coupled with the only direct track to track transition on the EP, takes this seemingly small and less significant artistic choice and gives it much more reason for praise. That said, aforementioned “Head Trauma” very clearly aligns with a staple of mainstream pop punk, as the switch from stripped down and slow, to uptempo and full band flourish halfway through, mirrors the slow, exposed, fast, and dense opposites of songs from Green Day’s “American Idiot” era. All in all however, Hollows is really very remarkable. The EP pulls no punches on embracing discussion of losing and reviving one’s faith, vacillations with idealism and depression, uncertainty about the role of religion and God in human existence, and even bouts of self-depreciation that avert a pure melodramatic emo delegation due almost entirely to just the way City Mouth chooses to pair tempo with and tonal progression with vocal delivery. This is a not-so-secretly spiritual release that thrives with the energetic momentum pop punk provides. Yet, for all of Hollows religious intensity, City Mouth doesn’t need a Christian label and the EP isn’t dead set on inspiring conversions or defections. The record can just as easily be put on repeat for its artistic perspicacity if the time and place of playback don’t call for a concentrated listening session or allow for layered analysis. Hollows is out now via Take This to Heart Records.